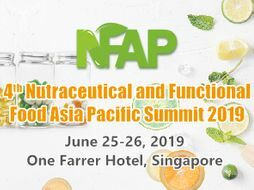 With these developments underway, the 4rd Nutraceutical and Functional Food Asia Pacific Summit 2019 will educate attendees on the regulatory framework for functional foods in important jurisdictions, and detail important market developments, to facilitate optimal business strategies and product development within the industry. Furthermore, the summit will provide opportunities for delegates representing a diverse range of enterprises and institutions, to find business partners for productive collaboration. - Unique opportunity to gain a foothold in a growing market - engage with new business partners and clients!